"X" marks the spot for game-dropping power. Super-X® delivers the precision and controlled expansion you demand. Maximum power, maximum efficiency. Packed 50 rounds in a box. Ideal for deer, elk and black bear. 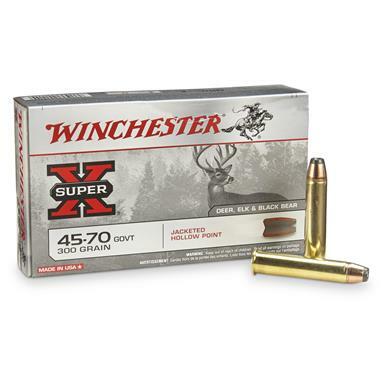 Winchester Super-X Rifle .45-70 Govt., 300 Grain, JHP, 20 rounds is rated 4.6 out of 5 by 24. Rated 5 out of 5 by jimbo from Good price-good deal Very good price. Rated 5 out of 5 by Jeffrey from Great load,Best Brass for Trapdoor This load is very good but maybe too hot for my trapdoors. I shoot this in my Uberti 1885 High Wall remake but use the brass to reload for the older trapdoors. Only the Winchester brass lacks a groove cut in the case above the rim, and only Win brass will eject from one of my early trapdoors. Rated 4 out of 5 by Jeffrey from Excellent price for a powerful load The cartridge is economical and powerful, though I noticed the cases were not pristine, several having a few dings and deep scratches (they looked like reloads).I fired these out of a Uberti remake of a Winchester high wall single-shot with a crescent buttplate, and she kicked like a mule. I'll pick a softer load next time. Rated 3 out of 5 by Jolooote from 45-70 300 Gr. ammo This is the 1st time I've bought ammo for my New 1895 Marlin 45-70. Mass confusion resulted from the fact that the advertised picture of a 'Necked down' shell casing is NOT 45-70 ammo. When I received ammo I had to drive 10 miles to local expert to find out if ammo or the picture was wrong. The price is a bit high. Free Shipping does NOT apply to ammo! Rated 5 out of 5 by NHaven from Bang for the Buck I haven't even fired them yet but I already know how they will perform and there will be no complaints. Rated 5 out of 5 by Gerrard from Winchester 45-70 ammo topnotch product at a good price!